There are several things we need to customize in blogger to get the better navigation and user experience in blog. If you are owning the blogspot and want it more frequently clicked by search engine users. In short if you loves organic traffic to your site then you need to change the side of title in the title bar of blogger. Blogger by default gives the site title at the left side like ‘BlogName-Pagetitle’ on title bar. Here the blog name is the Name given by you to your blog. Page title is the title of your blog post. Google index your site and human tendency is to reads from left to right in search results. Among all the search engine results your site page also available but user won’t click on your page because your page having the blog name first and important content last. If you want your site most frequently visited by organic traffic then you have to specify the Page Title first and then Blog Name as mentioned in below image. Check your site content by typing site:yourweburl.com in google. Now you are done and you can check your blog page title bar by refreshing page and you’ll get the title after the post title as below. Its take some time to be indexed your content as google crawlers re crawl your site and available to you. Wait and re-check your content in search engine results and get the more organic traffic after this change to your site. Thanks and comment below to raise issues. Blogger is used by many people nowadays as it provides very easy interface to the user but there are many things you need to customize yourself and for that you need to interact with the blogger template. 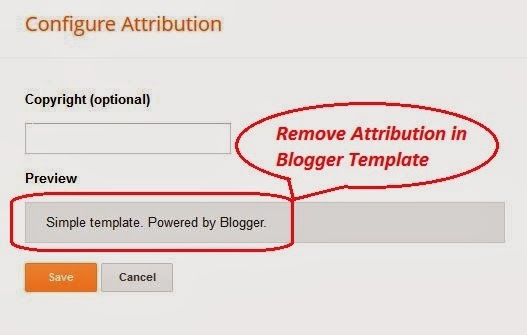 Here we’ll see how to remove the blogger attribution tag from the blog because it contains the name of the template used by blog and the powered by blogger text also. So if you really want to get rid of the attribution tag then go to the Dashboard. Inside the blogger from the left panel select the Template. Backup Template first because you are going to edit the template HTML, wrong change inside html affects the entire blog layout. So it is important to backup it first. To backup go to the Backup/Restore on right side and click on Download Full Template before any change. Now click on button Edit HTML and click inside the template code. Press ctrl+f to find the </head> section of the html. To remove the attribution place the below code above the </head> tag. Now you are done with Editing, save the Template and view your blog and hope you successfully removed Attribution from your Blog. If you still having the issue with your Attribution, raise your issue by commenting. Thanks and Don’t forget to comment below on this article. You can customize your needs in blogger by tweaking the blogger Template. But before doing serious changes in the blogger template, It’s recommended to backup it first. If you do changes directly into template HTML code, then wrong changes may affect the entire view and performance of website or blog. So before digging into the HTML code, backup first by simple guidelines. Now Download full template into your computer and then do changes in HTML Template as required. So you can restore your template after accidental changes. Note : If You want to restore template, then you can do from here only. Click on browse button and select the backed up or new template for your blogger from the hard drive and you’re done.